Would you reach in and take it? I'd look for a booby trap or hidden camera. 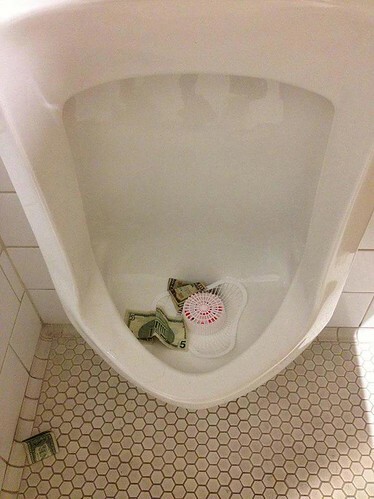 They say that money is the dirtiest stuff around... this pretty much confirms it. I'd make sure there was soap and the sink worked, better yet if that bathroom had sanitizer, like mcdonalds. I dropped my phone in my home toilet, didn't have time to think about that one. 98Sonosls, chevyriders, 5FootWonder and 1 others like this. The urinal doesn't look that bad actually, one of the cleaner urinals I've seen lately. With a bit of paper towel or tp from the nearby stall sure. Throw them in the sink and give'em a wash then wrap'em up in tp or pt. Piss is mostly ammonia, water and salts anyway. Now if it was crap in there or a 5 in the toilet. Fck no flush it. No problem, if that was going to hurt you, you'd already be dead. If you don't get it no one will. Nothing gets past grinder pumps except condoms and tampon applicators. Exactly! Plus, this place looks like it could be a restaurant. I think the waiter/waitress deserves exactly $16. dnyce and 5FootWonder like this. Wouldn't be the first time I had piss on my hands, or the last time. Use the one on the floor to pick up the two in the pi$$er. Wash it all off. Paper money isn't really paper.